Is this dish cooked with dog or puppy meat? Be assured that no cute pets were being slaughtered in the process of cooking this dish. Hahaha. It is rumoured that this dish was named as such because it tasted like “dog meat”. Is it true? I’m not sure because I have not tasted dog meat myself so I cannot verify this. The duck is braised with tau cheong (bean paste), nam yue (red fermented bean curd), and the aromatic Chinese leek till is tender. The first time I’ve ever tasted this dish was when my mother-in-law cooked it. It was so good and tasty that I cannot forget how good it was!! Though this traditionally Cantonese dish is delicious, but sadly it is not very popular. Oh well, I am not surprised if you have not heard of this before. I thought it would be a waste if I did not write down the recipe as I would love to continue to see this dish on our homecooked menu. Rub the duck in salt and let sit for about 15 minutes. Rinse off the salt and blood from the duck pieces . Then drip dry. 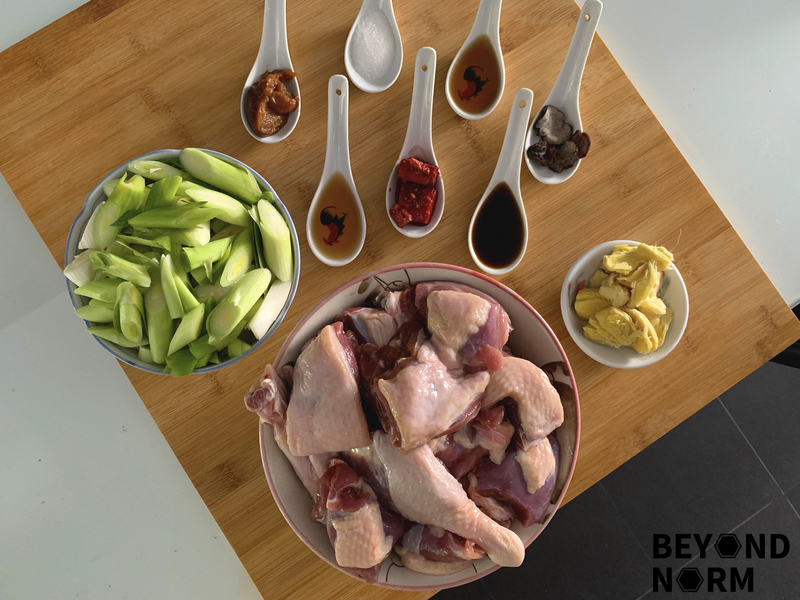 Marinade the duck pieces with the 1½ tablespoons of light soy sauce and the corn flour. Let sit for about 1 hour or more. In a wok, heat up 2 tablespoons of cooking oil. Add in the duck. Cook till fragrant and all the pieces are browned. 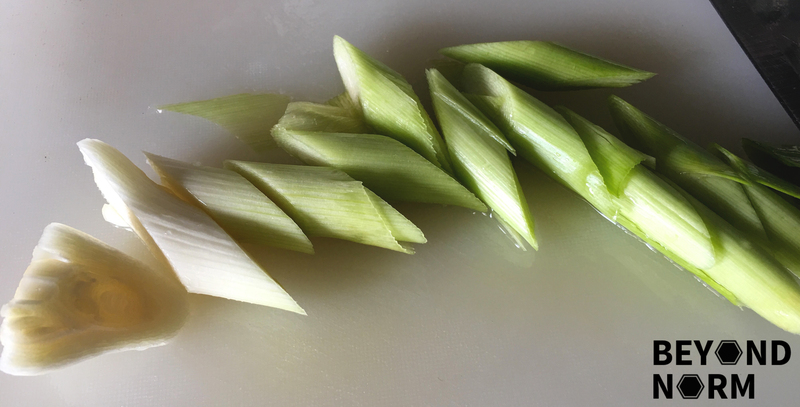 Using the same wok, add in the ginger and white part of the leeks. Then fry till fragrant. Next, add in the bean paste and nam yue and fry till fragrant. Add in the duck pieces and toss till they are mixed well. Add in Shao Xing wine and combine well. At this point, I transferred all the ingredients into a claypot. You can continue cooking the dish in the wok if you wish. 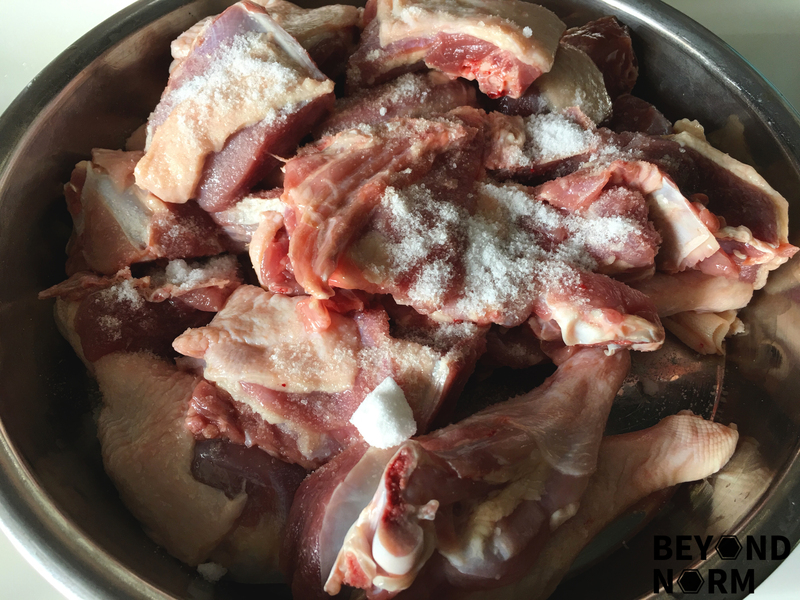 Add in enough water to cover the duck, the seasoning, and the red fermented bean curd juice. Then mix well. Bring it to a boil and cover the claypot/wok. Simmer under medium-low heat for about 1 hour and 15 minutes. Check the water level in the pot now and add water if needed. After the 1 hour and 15 minutes, add in the green part of the leeks and simmer for another 10 minutes. If you like, you may add in some corn flour to thicken the sauce after step 12.